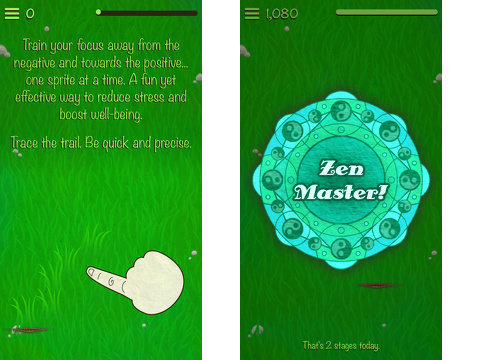 The Personal Zen iPhone and iPod Touch app is a cool way to chill out. The developers include neuroscientists who believe playing it can help you reduce your stress level. Regardless of the scientific research, it is an unusual, yet engaging experience. Personal Zen is a perfect companion during a long commute. It is equally useful as a pleasant distraction for times where you need to fiddle with your iPhone, but don’t want to think too much. The screen’s background is a field of grass, and a relaxing soundtrack plays. Two sprites pop up in the field. One sprite is angry, and the other is happy. Blades of grass are highlighted in a bolder color and move like a wind is blowing. You swipe the screen and follow the highlighted blades of grass. The goal is to move as quickly and accurately as possible. You earn points for effective swipes. When you start, the instruction is minimal. You are directed to move from negative to positive. I tried to swipe from the angry sprite to the happy sprite. I took the directions literally, but I was not swiping in the correct direction. I changed my swipes from the happy to the end of the line of waving grass, and I was instantly rewarded with points. With the Personal Zen iPhone app, you ignore negativity. You focus only on the positive, and you swipe the screen quickly and carefully. It is unlike anything else you have downloaded from the iTunes App Store on your iPhone, and it is worth a try to see if it connects with you. 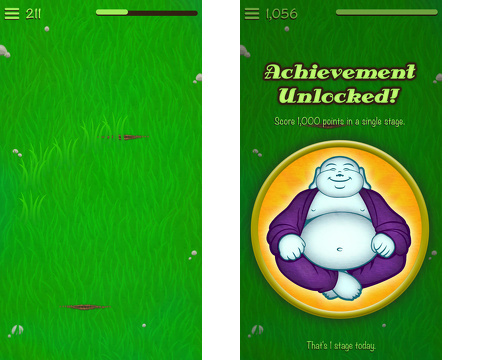 AppSafari review of Personal Zen was written by Jenni Ward on May 9th, 2014 and categorized under App Store, Free, Games, Health, Kids, Kids. Page viewed 12421 times, 9 so far today. Need help on using these apps? Please read the Help Page. It seems to be a good game, I will try. Very good game! I will try! I tried using this kind of app on my smartphone, and it did not work very well, I think it’s for my cell difrenciado be a model for other brands, perhaps ..
No, the app is great. You guys liked the app, check it out.